I just finished making the handle for this carving axe/hatchet. The head was custom forged for me by John Switzer of Black Bear Forge, who I met at the Lie-Nielsen hand tool event in Denver a while back. It’s O1 tool steel, differential tempered, with a punched eye. The handle is apple wood that I laminated to get the grain in the correct orientation for strength. As a result, the colors are a bit two-tone from the heartwood and sapwood. I got to use my fancy rasps and spokeshaves, so it was very fun to make. Finished with BLO. It sure cuts well, and fits my hand perfectly. What a cool AXE ! Looks good ! Looks great! Now it is time to use it on some projects. Durn that’s nice! I have wanted a carving axe for a long time, that one is sweet! A beautiful Axe like that and you cheaped out on a couple of wedges? Have you no shame! LOL! 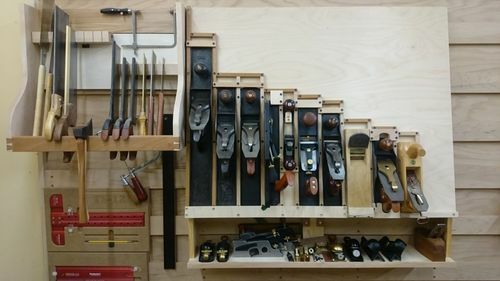 Great pics of a beautiful tool, Allen! Nice shape and top ending. I really like that, are you going to do some carving? Alan, that is a beautiful axe. Well done. Thats awesome. I think it will look even better as that apple starts to age. Nice work!